With our Automated Collections bundle, NetSuite users can fully automate their Accounts Receivable processes directly from their NetSuite account. This proprietary SuiteApp automatically communicates with customers based on the age of their past-due invoice. The Automated Collections bundle also protects against data-entry errors, prevents miscommunication with customers, and provides daily status reports to your A/R staff. At Aminian Business Services, we take pride in having designed and implemented a number of projects for customers who were seeking solutions that are not available in a NetSuite “out-of-the-box” configuration. Our applications and extensions seamlessly integrate with NetSuite’s free product upgrades, making IT nightmares a thing of the past. Contact us today to discover how our seasoned staff can customize end-to-end business processes to your precise business requirements. Dunning messages are notices that indicate how far account balances are overdue and usually demand prompt payment. These notices can vary in severity depending on the length of time that a customer’s account is overdue. You can set up to 4 different messages to be automatically emailed to your past-due accounts. Each auto generated email message originated by Aminian’s Automated Collections for NetSuite is logged under the “Messages” tab of the Invoice transaction in your NetSuite account. 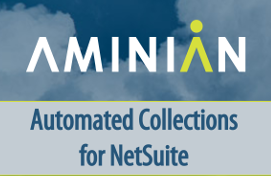 Aminian’s Automated Collections for NetSuite provides the flexibility to exclude any customer by clicking on a check-box. The invoices associated with these customers will show on the Dashboard Portlet as “Exception Invoices” which you can process outside of the application. Easily view all aging invoices on your dashboard categorized by the past-due levels. Receive a daily email summary of the past-due notices that were sent to your customers. Request more specific information by telling us about your Netsuite and/or business needs.